Our homes have always been a source of shame for us. This is why we locked ourselves behind those doors and refused to let anyone into our homes and our lives. We were fearful that someone would find out our dirty little secret. We felt that we were the only ones in the whole wide world that lived this way. I wrote Sink Reflections for you. This book is dedicated to YOU, who have suffered in silence, thinking that you were the only one in the world who lived in CHAOS! We no longer have to suffer with our shame. FLYing gives you the tools to deal with your home and yourself. You see you never dreamed that the state of your home was a symptom of your problem and not the problem itself. You have said it thousands of times, “If only I could get the house clean; everything would be OK.” That is not how it works. We have read every self help book ever printed because we were looking for that special tip that would be the saving grace. There is no special tip for house cleaning. It just has to be done. The problem has always been our perfectionism. As children we were taught by our parents that if you can’t do it right don’t do it all. It was a lesson we took to heart. We were also taught by example that cleaning took a huge block of time. I don’t know many people that have hours to devote to their homes. We all have busy schedules and just want our homes to magically clean themselves. Well that does not happen unless you have your routines firmly grounded. Even small routines will change your home. When you sandwich your new attitudes along with your routines, and toss in some love; you have the recipe for a wonder comfort zone that you can call home. In all those self-help books we were given tips for doing things. We all know how to clean; after all we are perfectionist; our biggest problem is moving when we have the chance. For years in our stinking thinking we cleaned for company. We didn’t have time to do a little every day, because we didn’t think it would do any good at all. We felt that we needed a whole day to clean and then we would be so proud of ourselves when we stood back and looked at what we had accomplished. That would only last a few hours because the clean would start to disintegrate around us: All because we didn’t have routines to help us keep it up. Routines are not the straight jackets that we thought they were. With them we can be even more spontaneous than before because now we can open our doors and not hide. Before in our CHAOS; we had to have lots of notice to get ready for company. It would take day or weeks to get it together and an all night cramming session the day before the company arrived. We looked and felt awful because we were not taking care of ourselves. We were such a joy to be around! NOT!!! Did you know that your family deserves to be treated like company and you do too? Since it has always taken so long to get ready for company then we just didn’t think we were worth it. Well we are and now you know how to do it without being overwhelmed by the process. The secret to keeping your home in this comfort zone is to pick up after yourself. I asked my clerk one time about this. I had crisis cleaned to get ready for Thanksgiving and I was afraid that it would all fall apart before Thursday and I would be up half the night to get ready for our guest. Since she is Born Organized I interviewed her about how to keep it together. She kind of chuckled at me and said it is really quite simple, Marla. All you have to do is pick up after yourself. That was a light bulb moment for me. If I get it out, I put it away. Wow it is that simple after all. That was the day that I started to practice picking up after myself. I would be on watch for those tell-tell words, “I can do that later, I’ll just put it here for a minute till…..” That was my warning sign that I was getting ready to build a hot spot. It is just amazing when one of your flat surfaces is clean; how much that piece of paper stands out. Kind of like a sore thumb. Half the battle of having a home ready for company all the time is to have your favorite dumping grounds(hot spots) clear. Your house can have dust every where and floors that need doing, but if your hot spots are extinguished, then your home looks clean because the clutter isn’t in your face. I don’t let our home get more 15 minutes worth of cluttered. We could have a party tonight if we wanted. Fling open our doors and let our friends into our lives. Could you do this without a panic? It is so peaceful to know that your home is ready and your bathroom is presentable. I want for you what I have and this peace came from building my routines one habit at a time and changing my attitude toward my home. Are you ready to FLY by eliminating the CHAOS in your life? My sister wrote a wonderful book to help you understand how it all fits together. Hidden Treasures is a novel and will be a great way for you to get back to basics. 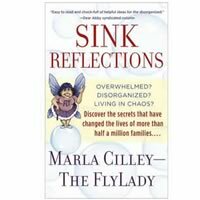 This entry was posted in Morning Musing and tagged flylady, Sink Reflections, suffering. Bookmark the permalink.